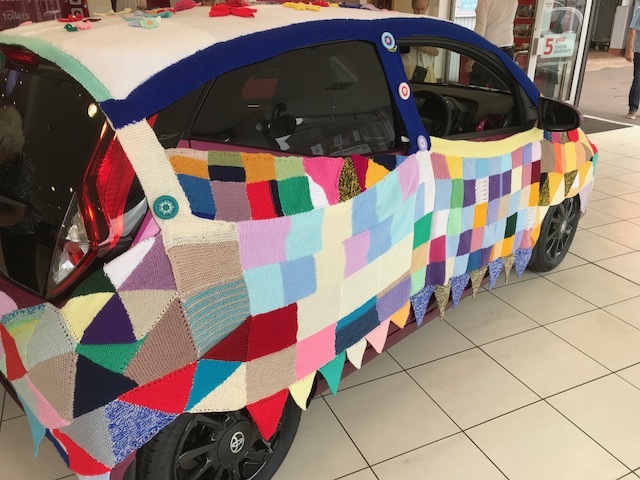 Keen knitters from The Helensburgh and Lomond Knitting Bee group have been hard at work creating a stunning cover for the new Toyota AYGO. The group was formed by Argyll & Bute Third Sector Interface (TSI) and Alzheimer Scotland and is open to everyone in the community offering informal knitting for beginners and beyond. 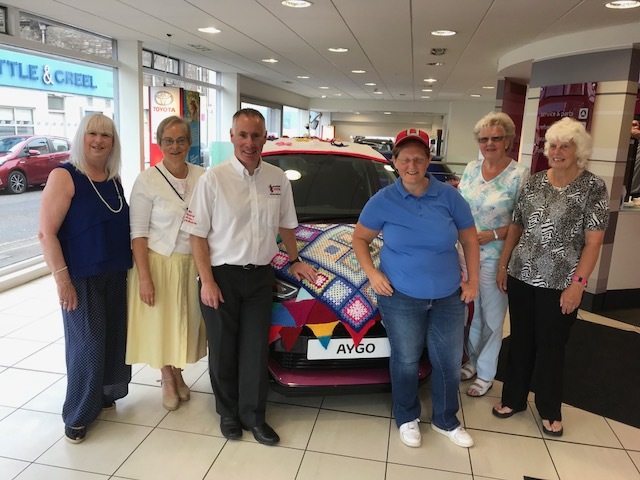 Helensburgh Toyota set the group a challenge to design a cover for one of its models, the AYGO. After a lot of hard work, members of the group unveiled the new design at a recent event held at Helensburgh Toyota. 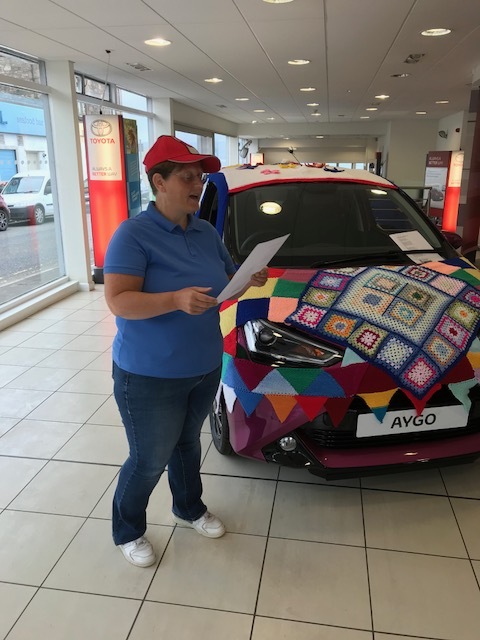 Such is the popularity of the AYGO that local performance poet Gracey Flair created her own wee ditty to the tune of ‘Song of the Clyde’ entitled “Aygo’s Here and Aye Goes There”. 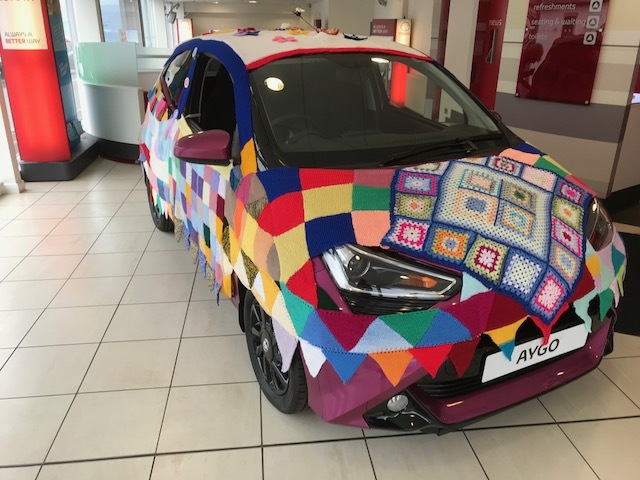 Helensburgh Toyota donated £100 to the group which will be used for materials, trips and social events planned later on in the year including a trip to a similar knitting group in Campbeltown. The ladies who worked on the project included Linda O’Connor, Margaret Harper, Maria Conkie and Wilma Gilchrist. Help was also given by others including Rosalind, Jane, Joan, Liz and Isa. The Knitting Bee group meet every Friday for knitting, natters and coffee at the Dementia Resource Centre in Helensburgh. They are currently taking a summer break but anyone who is interested in coming along can contact Alison Gildea on 01436 671613 or Clare Stockwood on 01436 678050. The Toyota Aygo’s here, aye goes there. The Toyota Aygo goes everywhere. with fun in oor toons as we zip in and oot. There was a boy racer called ‘Helensburgh John’. He took out his gran for a tea and a scone. encouraged his study with soup every night. she wanted her wee man to top all his tests. he worked like a dream like them cars from Japan. Her funky wee monkey was aff for the fair. They travelled the roads seems both without a care. a safe roomy cabin to jaunt to the sea. with X-factor frontage and toys as one does. The car it would beep if it went aff the track. In caring for Nana he’d mastered the knack. He brought her such joy and he always was fun. She sometimes forgot though he was her grandson. but with John by her side she won’t be on her own. to drive out to Nanas to check she’s dain fine. but one things she’s sure of is – THIS BOY CAN DRIVE!